After a year's absence, the world's best riders return to Windham, New York, for the penultimate round of the UCI Mountain Bike World Cup. Less than 90 minutes drive from New York City, this village of less than 2000 inhabitants in the beautiful Catskill Mountains of Rip van Winkle fame is rolling out the red carpet as it seeks to transform itself from a quaint ski town to a four-season vacation destination. Three disciplines of racing are on the agenda. The Eliminator kicks off the weekend on Friday evening, Saturday is the Downhill, and Sunday wraps up with the Cross-country races. The Eliminator takes place immediately in front of the main chalet for the ski hill, on an 825 metre circuit where spectators will be able to see almost the entire course from one spot. The circuit opens with an uphill sprint, followed by a descent and another climb. The riders then traverse a grassy slope before a 180-degree turn onto the finishing straight. 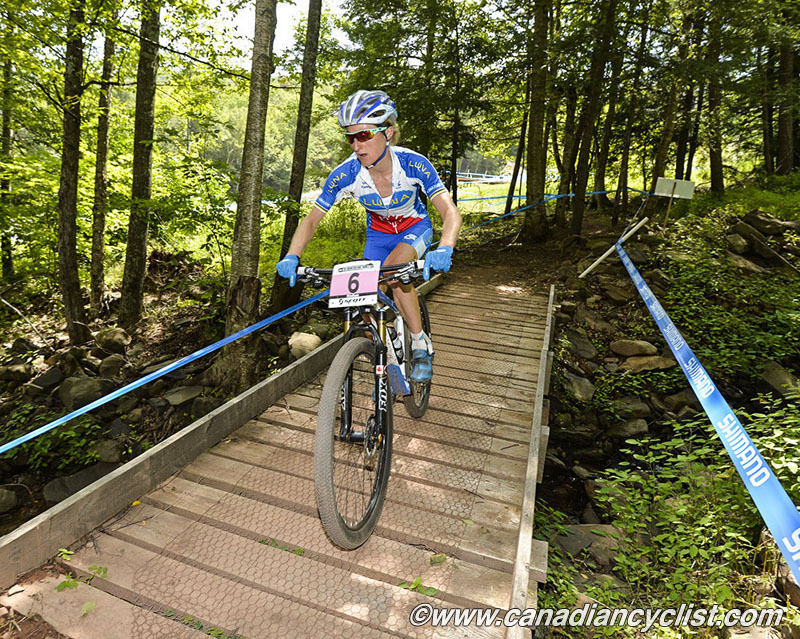 After her win last weekend at Mont Ste-Anne, Canada, Kathrin Stirnemann (Sabine Spitz Haibike) has taken a commanding lead in the women's standings, with 185 points. World champion Alexandra Engen (Ghost Factory), the former leader, missed last week and will miss this week, due to fatigue, so Stirnemann could wrap up the women's title with a win here. 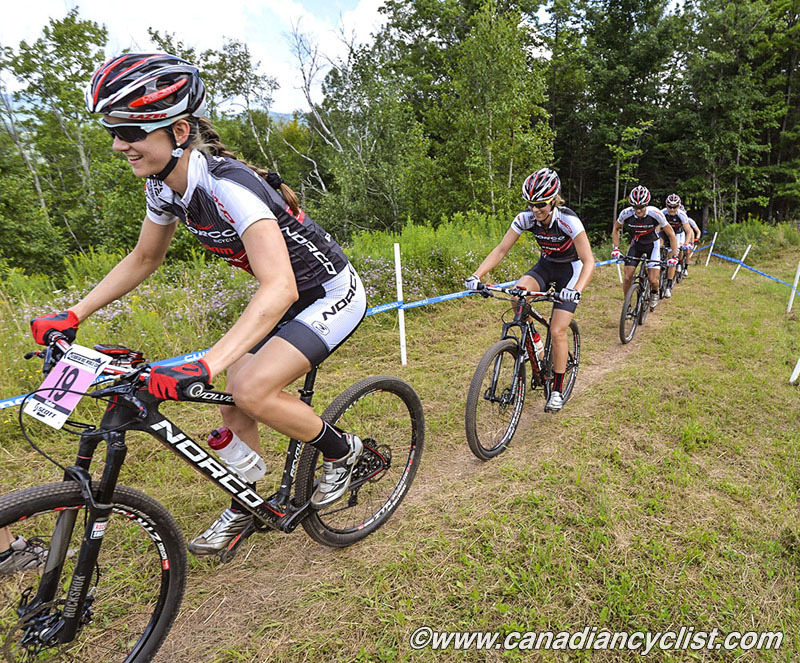 Others to watch for on the podium include Jenny Rissveds (Scott-Odlo), Kate Courtney (Specialized Racing XC) and Canadian Andreane Lanthier-Nadeau (Rocky Mountain). Jolanda Neff (Liv Pro XC) has a stranglehold on the women's overall lead, with 310 points over second place Emily Batty (Trek Factory Racing). However, the battle for second through fifth in the overall standings is extremely tight, with 10 riders within 90 points of each other. Neff will once again be a favourite, as will Catharine Pendrel (Luna), second to Neff last weekend in Mont Ste Anne, and the defending champion at Windham. Others to watch will be Batty, Katerina Nash (Luna) and American champion Lea Davison (Specialized Racing XC). The men's race will likely be another battle between the two riders that have been head and shoulders above the rest of the field this season: World Cup leader Julian Absalon (BMC) and world champion Nino Schurter (Scott-Odlo). Between the two, they have won all five rounds of the World Cup this season. Absalon has one more win, but Schurter won last weekend, so it could go either way. Others to watch for on the podium will be Australian Daniel McConnell (Trek Factory Racing) and the Flückiger brothers - Lukas (BMC) and Mathias (Stockli). 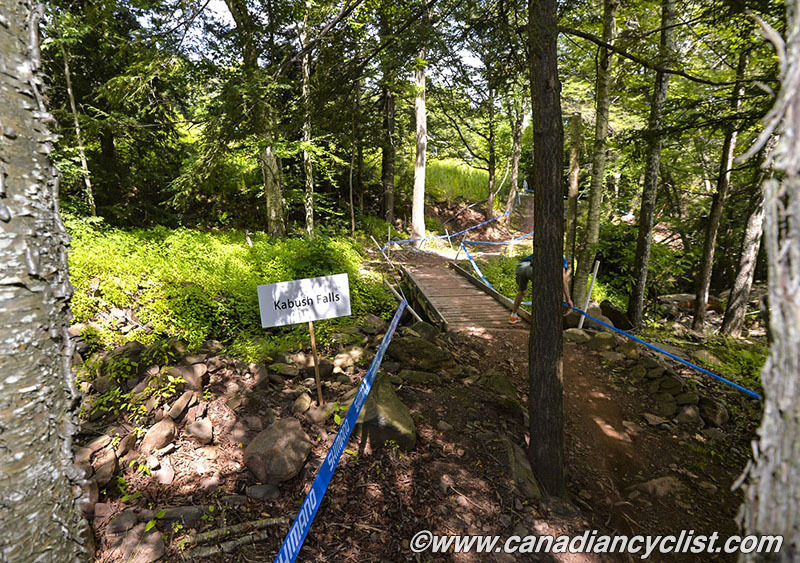 The cross-country course has been shortened from the 2012 version, an alteration that current national and Commonwealth Games champion Catharine Pendrel commented on: "I really like the changes that they've made from previous years. The climb doesn't go up as high but it still has all the great traversing singletrack sections. The climb is pretty technical and demanding; a nice mix between really physical and technical, and the descent is really fast and fun." "The course is good. I like it," said Raphaël Gagné (Rocky Mountain Factory). "It's a little shorter so maybe a bit more balanced even though it's a long-climb course. It's basically one main climb broken into two parts with a tiny bit of descent between those climbs and a last long descent." "I wasn't around when it was old-school racing," stated U23 racer Haley Smith (Norco Factory Team), "But that's sort of what it feels like. The climbing taxes people mentally because it's unrelenting and it's long. The descent rewards guts and staying off your brakes and knowing how to take corners fast." Her teammate Andrew L'Esperance compared the course to that at Mont Tremblant: "A lot of the climbing is in the beginning and the rest of it is downhill and you get good recovery. A key part of the course is going to be transitioning from open climbing to technical stuff and carrying speed through those sections." All riders touched upon the importance of setting the correct tempo. "It will be important to pace yourself and find the right balance between going out too hard and positioning yourself well," stated Gagné. "Just pace yourself and have a good race." In 2012 local favourite Georgia Gould (Luna Pro Team) was heading to her maiden World Cup win, but was robbed of glory by a puncture, something her teammate Pendrel hasn't forgotten: "Windham in the past has typically been a course where a lot of people get flat tires, so it's also going to be about line choices and not taking risks where tire choice is concerned." The 1.51 kilometre downhill is slightly shorter than in previous years, and takes riders through the trees for much of its length, offering a combination of rocks and roots, and some sizable jumps. Manon Carpenter (Madison Saracen), with her third win of the series last weekend has taken a commanding lead in the women's competition, 160 points ahead of Emmeline Ragot (Lapierre Gravity Republic), with world champion Rachel Atherton (GT Factory) - the winner at Windham in 2012 - a further 20 points back. The race for the World Cup title is down to these three riders, all of whom have a win this season. Canada's Micayla Gatto (Pivot DH) finished just off the podium last week and will be looking to move up at least a spot here. The men's competition has tightened up, with three riders within 101 points of leader Troy Brosnan (Specialized Racing DH) of Australia. Josh Bryceland (Santa Cruz Syndicate) is on a roll, with a first and second in the past two World Cups, while US champion and defending Windham champion Aaron Gwin (Specialized Racing DH) would definitely like to win on home soil. Australia's Sam Hill (Chainreactioncycles.com/Nukeproof) could also be a strong podium contender after his win last weekend. Canada's top rider, Steve Smith (Devinci Global Racing), is out of action for an undetermined period while he recovers from an ankle injury suffered in training at Mont Ste Anne. 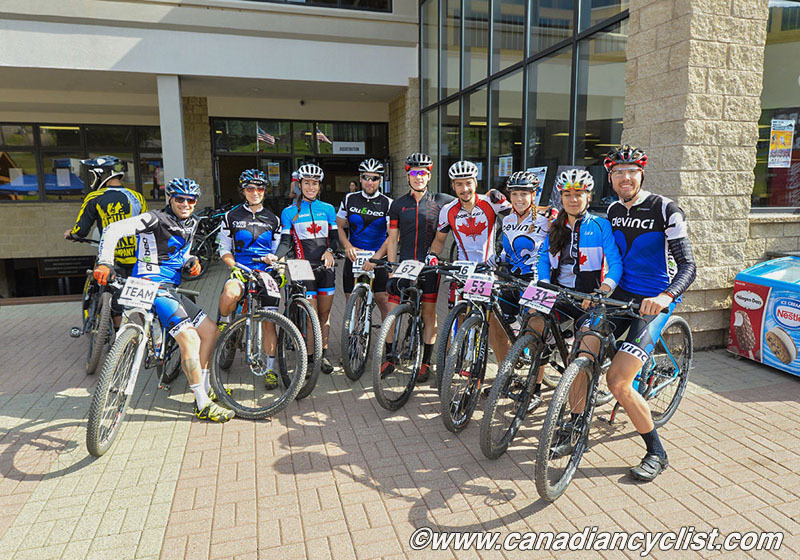 However, Canada has a new podium hopeful in the Junior men's category with Jack Iles (Evil Vengeance Tour), who was second last week. Micayla Gatto and Vaea Verbeeck (Intense/Go Pro) were the top Canadians in the downhill at Mont Ste-Anne, finishing sixth and seventh respectively. "I think it's awesome. It's really fast," noted Verbeeck of the 1.5km-long course. "It's still very technical with challenging lines, but there are different lines so every rider can pick their own way." Born in Tahiti, Verbeeck grew up in Granby, Québec, but moved to North Vancouver two years ago to train and ride full-time, a decision that paid off when she became the national champion in July. 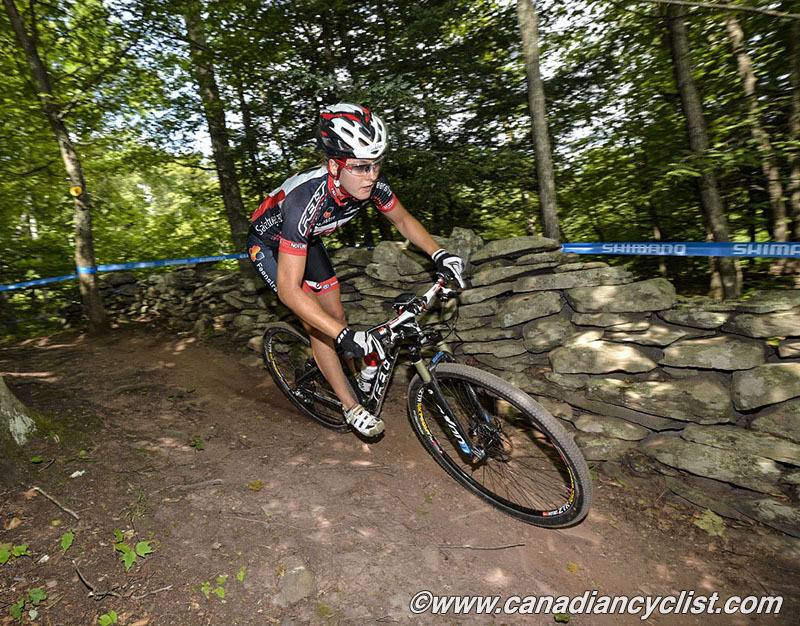 Gatto missed the podium by less than a second at Mont Ste. Anne, something she is hoping to rectify this weekend. "This track is a little bit tricky because everyone's going the same speed through the jumps and everything, and there isn't that much technical. What it's going to take is really paying attention to those little details because the overall speed is high. It's just getting that extra speed out of those trickier corners that's going to get you further ahead than the other girls." 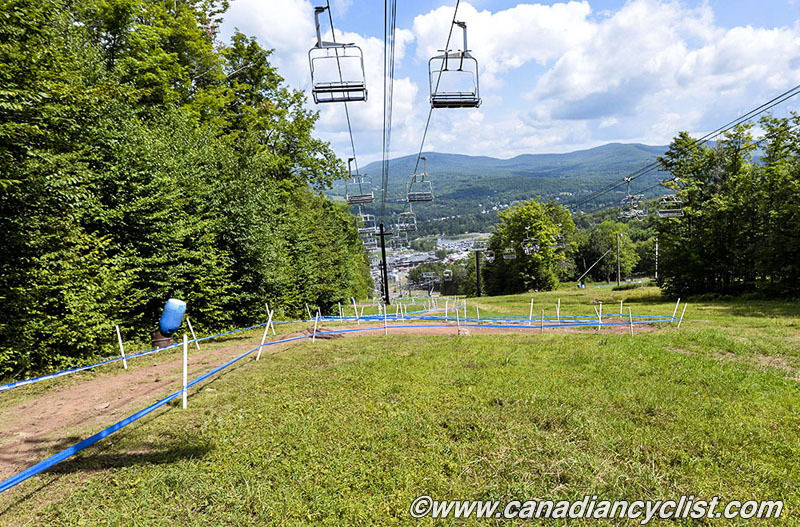 Mark Wallace (Devinci Global Racing) sees similarities between the Mont Ste-Anne and Windham courses. "They're both fast and pretty wide open with lots of rocks. This one's about half the length. I tend to do better on the longer courses but that's not to say it can't happen on a shorter one." The 19-year old from Duncan BC has a simple strategy for race day: "Just go full out the whole way. Super short; can't make any mistakes. Just have a good run." According to Gabe Fox, manager of the Devinci Global Racing team, Steve Smith's ankle injury is not as severe as was first feared, and there is reason to hope that the 2013 World Cup overall champion may race this year's World Championships in Hafjell, Norway. - Canadian Mike Drolet is the chief official here. - This is the second from last World Cup Eliminator, since it will not return for next season. - Despite early worries that tropical storm Bertha might bring rain to the region, the forecast is now for dry conditions, with sun and heat in the high-20s (Celcius) on Sunday. - Windham has a 'homey' feel to it compared to many World Cups, since it is such a small community and pretty much everyone gets involved. 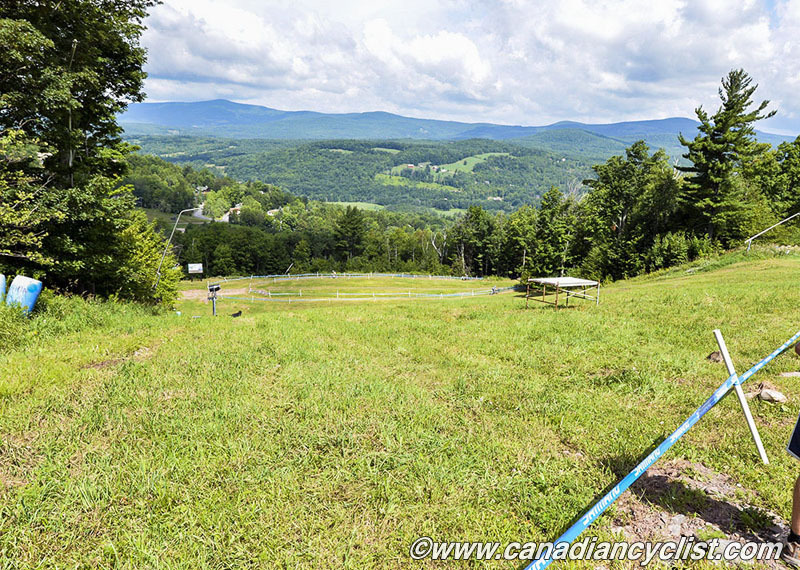 The hill will be adding a bike park in the future, an outgrowth of the success of the World Cup in putting Windham on the map as a mountain biking centre.